FileMaker Pro 14 template designed for small businesses. Is there a better alternative to FM Starting Point? Is FM Starting Point really the best app in Personal Info Managers category? Will FM Starting Point work good on macOS 10.13.4? 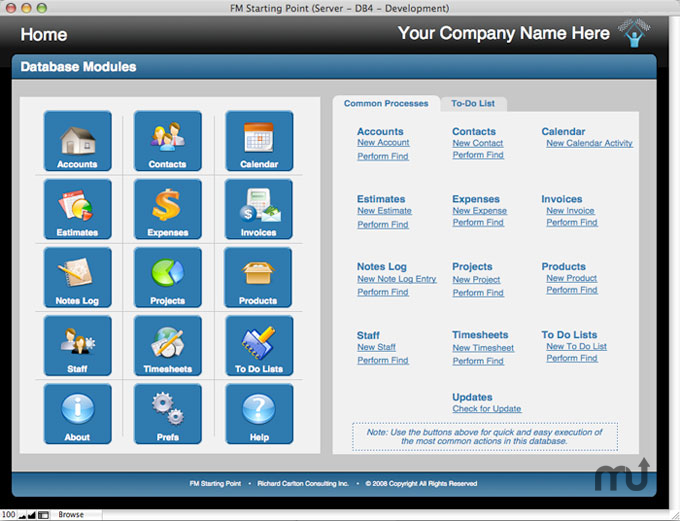 FM Starting Point is a completely free FileMaker template designed for use with FileMaker Pro 14, and is focused on small businesses, work groups, and non-profit organizations. These templates were built with the experience gained from working with these target groups for over 24 years. FMSP offers an integrated approach to an integral need in the business world - a complete CRM that is ready to be built upon to create the perfect solution for your specific needs. Experienced FileMaker Pro users will value a FREE tool that makes building a new project substantially easier. To save time on your next project, simply start off with a fresh copy of FM Starting Point, and add additional tables, fields, and scripts to fully customize the database to your exact needs. FMSP 4.5 features support for the new features of FileMaker 14, including popovers, and slide controls. Additionally, FMSP 4.5 is optimized for WebDirect 14, allowing for limited deployments, purely in a web browser.